Both a solar generator and a portable power storage unit, the Brunton Restore makes it a breeze to keep your hand held electronic devices fully charged and ready to go when your travels take you far away from the grid. A standard USB port enables you to charge the Restore from your car outlet or laptop. A mini USB wire (included) plugs into most standard electronic devices... or micro-USB an adapter is included... or use the charger included with your iPod,smartphone, camera or more. Once the initial charge begins to run low, flip open the Restore and watch the two solar panels juice up your battery. Compact, small, and light, the Restore is great to take on any multi-day backcountry adventure. A heavy-duty, rubberized casing provides a sure grip and protects from impact. This unit can store enough power to completely recharge most standard hand held electronics at least once or twice depending on the device. Battery Storage: 2,200 mAh battery Folded Dimensions: 5.5x3x1.25"
How do I use the Sun to charge my Restore? Place your Brunton under direct and bright sunlight with the solar PV facing upwards and angled at the Sun. There is never any need to press any buttons or connect any cables. The Brunton's charge indicator light may blink green, but this can be hard to see under direct sunlight. How long does it take to charge my Restore via solar power? 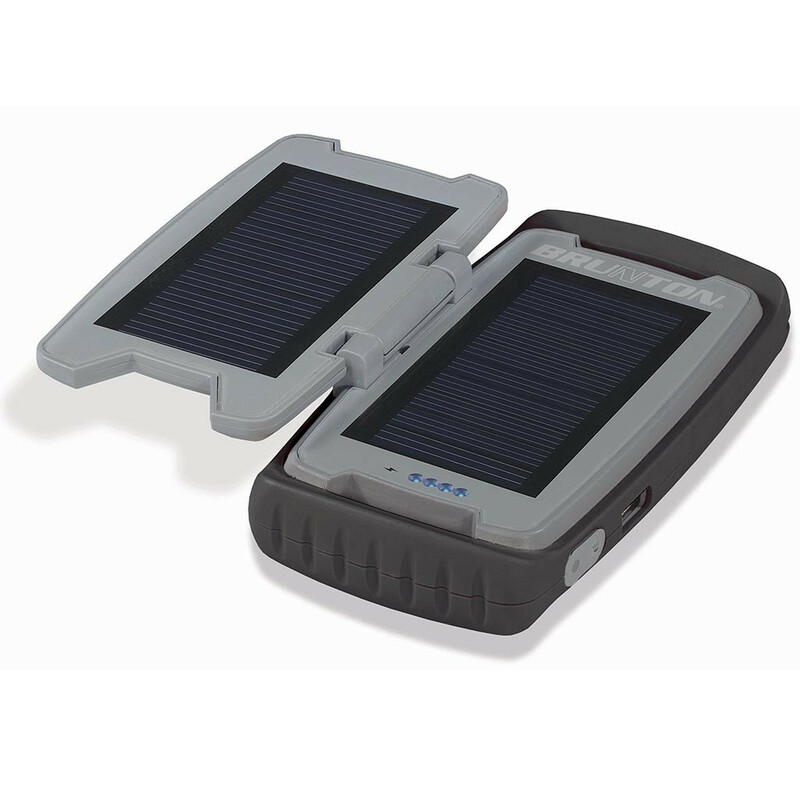 It is not simple to determine specific charge times for solar items. It is a very complicated subject and is influenced by many factors, including cloud cover, atmospheric conditions, season of the year, time of day, shade, shadows and the positioning of the charger, as well as your position on the planet. The Restore has 2200 milli-amp battery and comes with two (2) built-in 100 milli-amp solar panels. On average, if the Restore was completely out of power, it would take roughly 11 hours of sunlight to fully recharge it. My Restore is not charging correctly via solar power - what should I do? Your Brunton photovoltaic coverts sunlight into electricity whenever exposed to sunlight, but depending on many variables, you should reposition and adjust your Brunton charger to face the sun directly to maximize solar power collection. The Sun is usually the most powerful between the hours of 10am and 2pm. Any variables or obstructions that block sunlight - such as like shade or cloud cover will reduce effectiveness and increase charge times. Your Brunton charger is optimized for direct and full sunlight. Can I charge my Brunton charger through a window? Sure, you can - but charging through glass or windows blocks some of the solar energy from reaching your device and thus greatly reduces efficiency. If you plan on charging through a window, make sure the glass is as clean as possible. UV resistant glass further hinders effectiveness. Brunton does not encourage leaving your Brunton charger on your car's dashboard without supervision. The Adventure-armor can be damaged by extreme temperatures. The Brunton Company provides the Restore to be free from defect for 1 year.